Image © Ahoy Comics. Main story written by Tom Peyer, art by Jamal Igle & Juan Castro, Backup story written by Paul Constant, art by Gary Erskine, both colored by Andy Troy and lettered by Rob Steen. Additional material credits above. This book continues to surprise me, and after a lifetime of comics reading, that’s not easy to do. Most of the main characters show intelligence and resourcefulness in their mixed-up situations. Earth Alpha (the fun one) has Stinger knocking out his doctor and Deuce neutralizing the Earth Omega version of her boss, Number One, for instance. Even the signs on the buildings are clever and amusing, like the one on the Earth Alpha garage of sidekick Stinger labeled, “Abandoned Warehouse, No Trespassing.” Earth Omega has a criminal dive bar named the Razor and Kidney, while Earth Alpha has fun crime props like a huge piggy bank. And just when I think I know where the story is going, Peyer and Igle do something else more interesting. 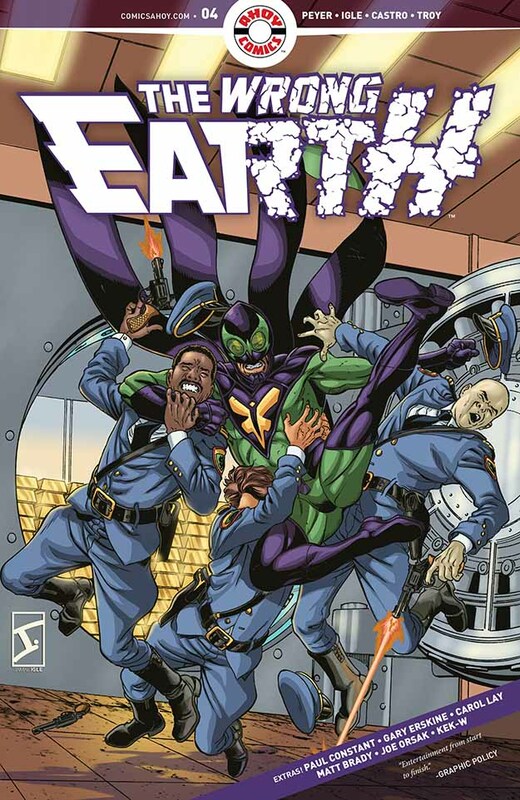 This entry was posted in Comics, Reviews on December 5, 2018 by Todd.